Home > Free > Carter’s Labor Day Sale & Coupons: 50% Off Sitewide + Extra 15% off! Carter’s Labor Day Sale & Coupons: 50% Off Sitewide + Extra 15% off! 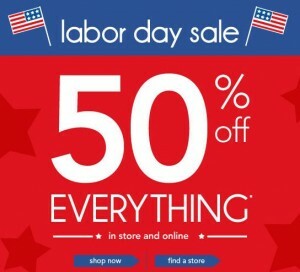 Carter’s is having a Labor Day Sale and offering 50% Off Everything! This deal is valid online or in-store, and while it’s not valid on Clearance items, there is still a huge selection of new arrivals for Fall for half price! Even better, you can stack with coupon code SH813C15 to get an extra 15% off or ABC2MV15 to get 20% off an order of $40 or more. Choose from clothing, shoes and accessories for baby, toddlers or school aged children. Shipping is $6 or FREE on order $50 or more.